In this three week trial, researchers used food questionnaires to assess usual intake prior to the study. ... on the basis of our intake questionnaire and food recall responses, we expected the parameters of the subjects on the ADA recommended diet to remain unchanged from baseline, but in fact they also improved reducing the differences observed with the two diets. I'm going to go out on a limb and suggest that the baseline reporting was, as has been demonstrated many times, flawed and subject to under reporting. Indeed, the fact that both groups lost weight despite being fed "weight maintaining" calories in the intervention, and a -- gasp! -- actual US Dietary Guidelines-compliant "low fat - high carb" diet indicates that ... well ... what would you say? Probably, that they weren't eating what they claimed, and when this has been assessed in metabolic ward studies, the macros have come out decidedly higher in fat as a percent. That's an educated guess. But it's not. Therefore, while calories should be matched, the one defining characteristic of a paleo diet is the higher meat and protein content (yes even in those who prefer to eat fattier cuts). So matching macros here provides control at the diet composition level at the sacrifice of testing what one might actually recognize as a paleo diet. Yes ... I realize I'm attempting to apply an impossible standard here, but I'm afraid in the end, whatever slight edge "paleo" may have had here, is likely not due to anything "paleo" per se. So they fed these diabetics the above diets. Check out the SFA by the way. Below AHA guidelines for the ADA and "starvation" levels according to one Nina Teicholz, NC,DP. What happened? Did the low fat, "deficient" in saturated fat diet, make matters worse? Nope. Not even with the neolithic foods of the ADA diet including more processed foods such as bread and pasta. To prevent weight loss, body weight was measured every 2 days, and if a deviation of three pounds from the third day’s weight in the study occurred calorie intake was adjusted. Sorry to slip negativity in here so soon, but one wonders what this adjustment was if indeed the average weight losses after three weeks were 4.64 lbs in the ADA group and 5.28 lbs in the paleo group -- over 1.5 lbs per week weight loss. On the upside, whatever "cheating" went on in this study, it was likely in the pre-study reporting of intake and/or not finishing all foods provided. On the downside, the researchers played "hide the weight loss" by reporting it in kilograms (2.1 ± 1.9 and 2.4 ± 0.7 respectively). 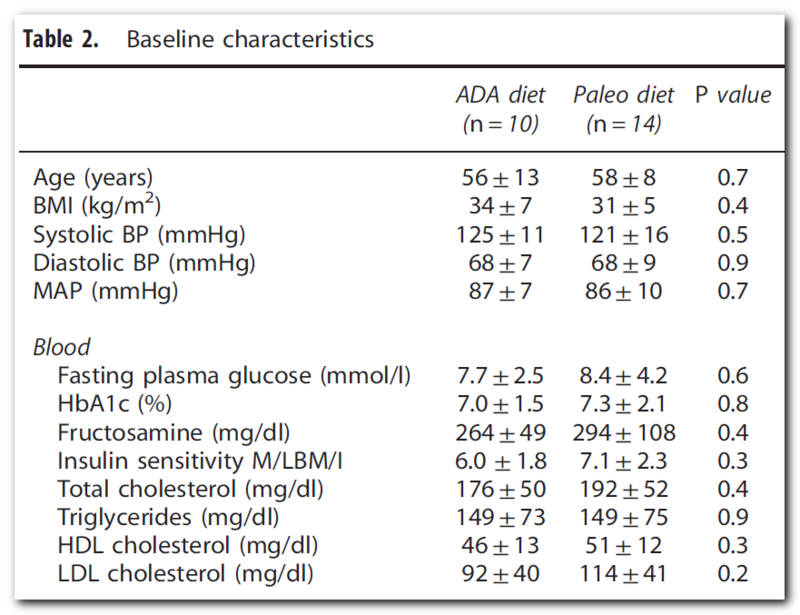 Look at the variability in the means as well, especially amongst the 10 ADA dieters. IF they were trying to adjust intakes every 2 days, how did this happen? Oh well. In any case, it appears that most/all of the dieters were in a mild to moderate caloric deficit while consuming more calories and/or carbs than for any of the myriad of dietary weight loss trials for diabetics. In the end, both groups tended to improve, on average, even if not always in a statistically or clinically meaningfully manner. Which goes to show that if you are a reasonably well controlled diabetic, changing the composition of your diet may help some, but it's probably more likely to produce significant changes to change the amount of food if overweight is the underlying issue. You may not believe me, but I was actually -- momentarily -- excited to learn that there was a study on the paleo diet in diabetics. Contrary to popular belief among my critics, I'd love nothing more than to see a dietary strategy tested and demonstrated to be effective and safe in a clinical setting, even with all the drawbacks inherent in that context. The low fat, high protein, high veg carb version of the diet is similar in proportions to a version of the LoBAG-30&40 diets. My excitement was short lived. For one reason. This was a two week trial*. I had to do a double take, because I was hoping for a two year trial, or perhaps two months ... but two weeks? 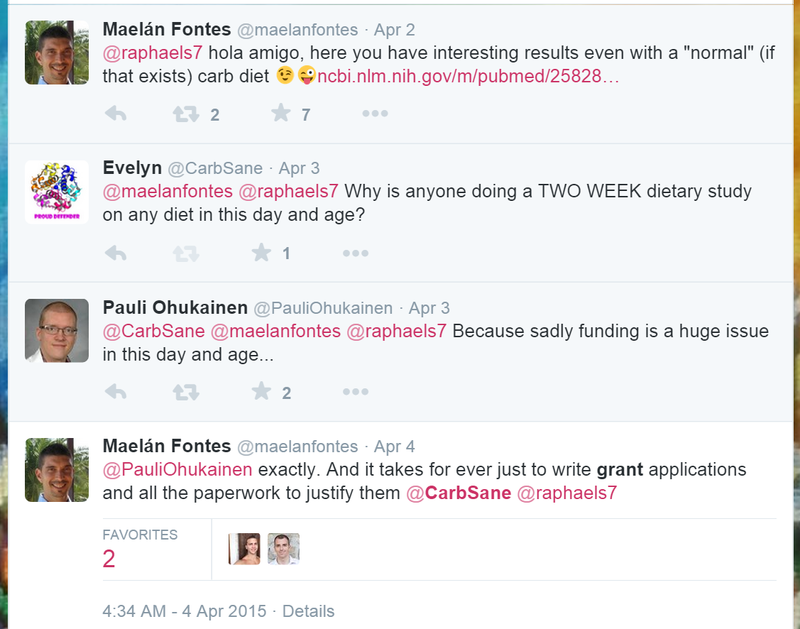 "This gives me no reason to change anything in my diet"
Returning to the primary Twitter exchange, to me, the scarcity of funds and tedium of the process of procuring them is even more reason not to do short studies without a compelling reason. I've spoken here a few times about the futility of the dietary RCT, most specifically in this post: Calling for the End of Diet Comparison RCTs ... somewhat serendipitously written in the wake of the last major paleo study to come down the pike (that two year study mentioned earlier). Perhaps I'm selfish, but I think most people out there who are looking for answers likely share my view on this. I don't really care if VLC is better than XYZ or if more people lost weight on ABC than PDQ. What I want to know is this: If I adopt this dietary change, and adhere to it, what kind of reasonable expectations can I have? Also, is it safe and effective for the long haul? To that end, don't ask me to ignore the track records of dietary practices of various cultures throughout millenia with seemingly good health, while misrepresenting those dietary practices to drive your agenda. If in one month, eating a "unnatural" amount of Q and eliminating M, a few grams of fat migrates from thigh depot to tummy depot, is this good/bad/lasting/significant/etc.?? I don't even really care about how difficult or easy anything is for anyone else to adhere to because we are all individual in this regard. Also, while I wouldn't dream of going on a crash diet just to lose a few pounds, that becomes a whole different issue if such a diet for a fixed time would reverse diabetes! I also have zero interest in the "success" of the Name-that-Diet arm of a study when the dietary recalls show that nobody followed the Name-that-Diet anyway. I don't know the budget for this study, but rather than an RCT diet comparison, I much rather would have seen changes with the paleo diet intervention for a longer period. Diets are NOT like drugs and it's time we stopped trying to test and compare them as if they were. We all have to eat. So I already talked about the major control aspect in this RCT: calories and macro composition of the diet. A repeat from Part I, but there were 10 ADA controls and 14 paleos. We are provided no information regarding the gender make up of either group. This is a horrible oversight, if it was one (nobody along the way noticed? ), or an egregious omission if it was intentional. In the previous intervention conducted by Frassetto's group, 6 of 9 were male, was it that gender imbalanced this time? A racial/ethnic breakdown was given, but no information as to how these randomized between groups. As has been seen recently with some studies conducted by other researchers, sometimes things "shake out" in unbalanced fashion in this regard especially when there are relatively small numbers and simple randomization (as appears to have been implemented here). Due to the 7 day ramp up period, the full paleo lasted only 2 weeks, with diet composition varying for an additional week. This was versus 3 full weeks on ADA. Given the short time frame of the intervention, the differences in diets for that 33% of the time may be meaningful. In addition to the types of foods, this diet is artificially "engineered" through the use of carrot juice and such, to dramatically increase potassium intake and reduce sodium intake. Steve Hamley noted some issues with units used to report content, and when adjusted, the paleo diet contained roughly one-third of the sodium, twice the potassium and half of the calcium compared with the ADA diet. This is more than just a food choice issue. Various starch sources are high in potassium without being high in sodium so long as added salt is avoided. So I consider the mineral issue here to be confounding to the "paleo vs. neo-ADA" diet comparison. I think it's safe to say that the Frassetto-style paleo diet is not representative of even the diet-book strict version of Paleo (see here), and certainly not of the post Taubesian take on things. This is, of course, an ongoing and underlying issue with the term "paleo" itself -- it has never been properly defined, even in the clinical context. But as things panned out, you have a comparison between mostly veggie/fruit sugar carbs vs. grain starch carbs on the ADA diet. I don't see this as a fair comparison or one that stikes a clear distinction between macro/type vs. source -- e.g. is starch along with the "grain stuff" the problem, or is it the starch. So it would have been nice to have a more balanced carb intake between diets. The ADA certainly doesn't say you have to get all your carbs from bread and rice and never let an apple pass your lips!! It has been well known since the Atwater days that veggie carbs (and to a lesser extent fruit carbs) are less available than those from refined starches, so in the end, matching the carb amounts is a bit deceptive here. A take home might be, however, that diabetics may do better with more veggies and fruit (as real carb sources) compared with starches. We have no idea who is taking what, and with what, and at what doses. Even if we did, it would be impossible, with these small numbers, to get around the confounding of these pharmaceuticals on the outcomes in this study. One is left to all manner of speculation as to whether the paleo group -- with slightly higher fasting glucose and LDL (thus TC) were less well controlled or less well off and thus taking more medication. True, the differences are not statistically significant, but this is the sort of thing that needless confounding brings. As has been mentioned, back in 2009, Frassetto's group conducted a small uncontrolled study on the paleo diet. The results were impressive for 10 days, but they could not say it was the paleo diet per se that produced those results. So at least it seems that this time around they decided TO do a randomized controlled trial. And then they threw that out, because there were no statistically significant differences in the outcomes between the paleo and the ADA diet. 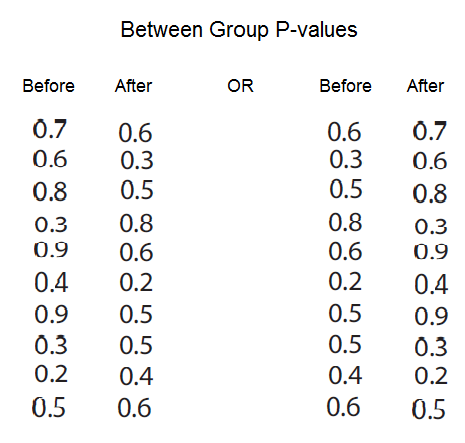 I mixed them up a bit, but I put the between group p-values side by side here. Yes one column is before and one is after. Would you even be able to tell which? Now this is not entirely fair, as I'm mixing apples and oranges (because that's all the values they provided allow), and this is not how it would be tested. But this does give one a feel for just how "insignificant" the dietary intervention was. In other words, what was called "similar" between groups at baseline caused "similar" changes between groups after the intervention. This was the case pretty much across the board (with the exception of fructosamine which I took out so you couldn't immediately tell which was the before/after). And for the record, the set on the left is in the correct order of before after. Oh ... Those Cholesterol Levels! Lastly, I cannot end this without a plea for the paleo community to get real about cholesterol levels. I do not know Frassetto's views on this (and I focus on her among the authors because she has presented at AHS at least twice), but if the Wolfs, Sissons, Sanfilippos and others in paleo are going to one day point to this study with mention of lipids, then they gotta pick a side. Does it matter? If it doesn't, then any improvements in the lipid panel through the magic diet are meaningless, right? If it does, then why does it only matter if/when the results are good, but not when they are indifferent or even send lipids in the wrong direction? 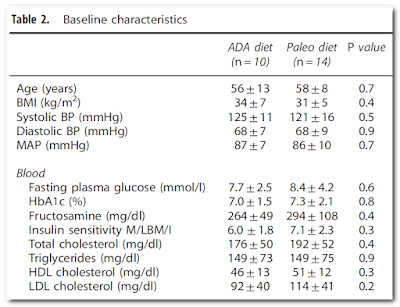 Since both LDL and HDL declined, so did TC the lipid improvements are 3/3 for paleo but only 1/3 for ADA which had a statistically insignificant reduction in LDL (and thus TC). Odd score card. Could this be because of the extremely low saturated fat content -- under 4% -- of the paleo diet? Or perhaps its due to the high fiber content, fiber being the other much maligned dietary factor in the "mainstream". Could all of this be the effect of low sat fat paleo diet on the hepatic insulin signaling (and LDL receptors) of the most metabolically deranged out of the 14 in that group? That seems to be the saving grace of this study. The real thing we learn here, which is nothing new, is that people tend to have, shall we say, an underappreciation for how much they eat. If someone else prepares and provides us with meals, we tend to do better at sticking to a plan, at least in the short term. IF these 24 subjects had been diligently following an ADA recommended diet, then that group would not have seen improvements and weight loss when it was provided for them. Never mind that the ADA diet would likely never be recommended at over-weight maintaining caloric levels as were utilized in this study. 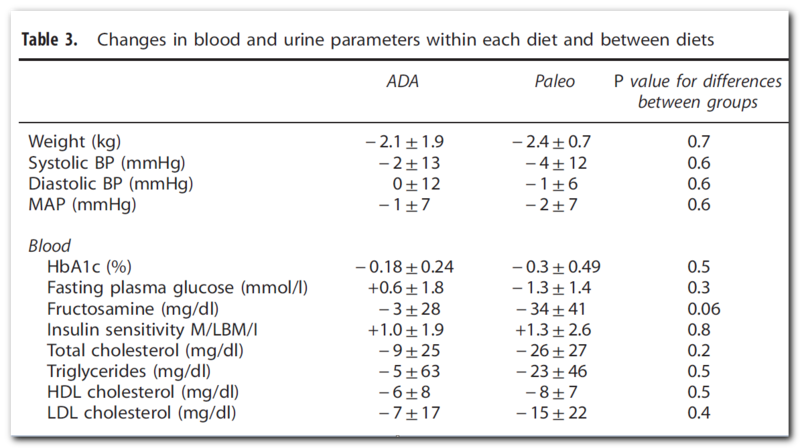 There was a 1 month follow-up wherein urine levels at least for the paleos confirmed that the subjects reverted to their habitual diets. No surprise, so, too, were their biomarkers trending back towards baseline. Beyond the fact that diabetics can lose weight on a variety of diets in an artificial setting for at least a couple of weeks, this study doesn't tell us anything. It's too small, too short and crucial details have been omitted. The confidence intervals on all of those measurements are huuuge. EasyHits4U - Your Free Manual Traffic Exchange - 1:1 Ratio, Business networking. FREE Advertising!